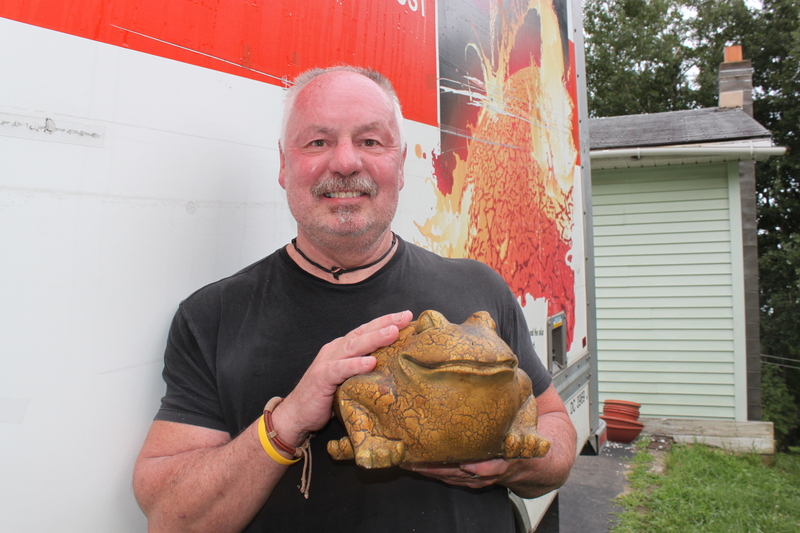 I got home the other evening to find a moving van in the driveway, Jeff in a whirlwind of activity and Darlusz Zabagaiski, the Polish frog who lives here, looking smug. Jeff, in my driveway with a moving van, holding Darlusz the Polish frog, as Jeff begins to move into my house. “I make dis happen,” Darlusz said. Jeff will be moving into my house. We agreed it made sense for a whole bunch of reasons, financial, friendship, you name it. He’ll gradually get his stuff from his Burlington condo to here in the next month. Darlusz, however, said this decision is all his doing. George Le Soq advised Darlusz to move to Vermont Darlusz did so by stowing away in a batch linens and towels Jeff brought to my house in late May. “See, dat Jeff iz goud man. I want to live here wid you, but want Jeff here too. He good for you. So I dust my magic in da stuff he brought to dis place here in May, and dat make him want to live here wid you. All tree of uz now live in dis houz. We have fun,” Darlusz said. Yes, we will. It will be a big, grand happy adventure. Stay tuned……. This entry was posted on July 21, 2010 at 12:11 pm and is filed under Uncategorized. You can follow any responses to this entry through the RSS 2.0 feed. You can leave a response, or trackback from your own site. the 3 of you living together!!! that’s like the odd couple plus one. your neighborbood will never be the same. p.s. i think it’s great news! congrats!